Chanel Spring 2011 – my spree! I couldn’t resist it. I was fairly restrained for me I think, I passed up a couple of things I’d have loved like the beautiful blusher, but it was hard! Chanel’s Spring Collection this year is really pretty and all of the lip products in particular stood out…but I have so many lipsticks, all barely touched because I rarely wear the same one twice in a month… I had to stop at just the one. So this is just a little look at the bits I did get. Firstly, Black Pearl polish. I don’t love this in the bottle, but I do love it on, it’s a soft grey to my eyes and although it has green in it, under electric light it seems a bit Air Force Blue. I really like it. Next up is Chanel Ombrés Perlées de Chanel eyeshadow compact, five iridescent shadows in a new formula that have received very mixed reviews in blogland so I’m hoping they work for me and I don’t join the those who haven’t got on with them…. we’ll see! Swatches are at the end of the post. And lastly, I was really taken with the Rouge Allure lipstick in Coquette. I do really love the Rouge Allure formula, it doesn’t last a terribly long time on me but it’s colour rich and so soft and moisturising. This is a nice shade that somehow manages to be bright and spring like without being too in your face. I’m smitten. And please excuse the startled expression, this is just to give you an idea of the colour in relation to my whole colouring. I shall have a good play with all this over the next few days and hope to bring you a “face of the day” post of them all in action. Shopping, but not as I know it! So with great weight loss comes a need for clothes that don’t fall off by themselves because they are too large. Everything, literally everything I owned became too big. Even my knickers kept falling down! So I had to shop and request clothes for Christmas! My husband sorted the underwear out for me and bought me a couple of jumper dresses, not pictured since they were in the wash, but I thought I’d show you what I’ve been buying over the last month! It’s not a complete list, there are a few boring items like jeans, and leggings that I didn’t bother taking pics of! Much of it is pretty dull but it’s very nice to have new clothes! Firstly I grabbed this Diesel Top. I love Diesel, I have quite a lot of Diesel tops. Easy casual wear. Obviously my head hasn’t shrunk with weightloss but I couldnt’ resist this little woolly beret. And I love this batwing sweater dress. It’s too big but I love it! Love this skirt! Plain black skinny long sleeved tee and opaque tights along with the boots you can see further down. A love this! Black/Blue skinny jeans and a check shirt. I’ve not worn such a fitted item as this shirt in so long, and now I can, and it’s so flattering on, I’d have to say that out of all my new things, this is by far the most slimming. Oh and I love this with the skinnies too. Looks so nice on. It’s really full and wide and hangs really nicely. Of course I needed new pyjamas too! Ah my beloved new boots. I get compliments in them everywhere I go and I’ve not worn heels for so long I thought they’d kill me, but a day in these is no issue at all. I live in them. So comfy and look really good! I wonder if I ought to take pictures of the other bits I got too. We’ll see. Anyway, its been so nice getting new clothes, I’ve really enjoyed it, it’s helped me feel really good about myself! What have you bought recently? Have you had any January sales bargains, are there any sales still going on that you think I ought to be checking out? The first item is the Decadent Duo in Tango and Argentino. It is beautiful. It’s a liquid blush on one end and a gloss on the other and it really is beautiful. The liquid blush is a natural flush colour that blends like a dream and the lipgloss is a sheer pink with a hint of sparkle. However, I do kind of wish I hadn’t bought this as they are so tiny. I’d rather have used my money to buy one of the gorgeous blush wand, but you know, they weren’t half price, this was, and it is glorious. I just can’t see it lasting me very long at all which is disappointing. In the second picture the order is Gracious Arasari, Veiled Lyrebird and Tantalizing Lovebird. I have mixed feelings on these. The packaging is glorious, as are the colours! The level of pigment is pretty good. Gracious Arasari is the least shimmery of them all, and I must say I struggle to get it show up on my lid, it’s fine in it’s pigment levels, it just is very pale. Veiled Lyrebird and Tantalizing Lovebird are both stunning shades but they are very similar on my eyelid so they merge into one! Seperately they are stunning and for me, rather than wearing these shades together, I will probably end up wearing these when I want a single colour. Don’t get me wrong, the formula of these is beautiful, and the swatches glorious, there’s nothing wrong with the products at all, it’s just the colours I chose! You’ll see what I mean when you see the swatches shortly! The last product I bought is the absolute highlight of my spree. The If It Were Summer Still Bronzing Glow Powder in Netherway Cove. Hands down the best bronzer I have ever owned in my life. Probably the picture won’t demonstrate this too well but I cannot describe how perfect this is on my skin. It’s a brown shade with a hint of pink and absolutely not even a hint of orange. On my pale skin this is absolutely amazing. I find with bronzers I have to be so careful, one wrong brush stroke and I look like I’ve been tangoed. Not so so with this one. It’s subtle and buildable. A light dusting gives me the gentlest wash of tan and as I say I can keep building until I get the desired strength of colour. I do want to show you this and all the other product in a FotD post but I’ve decided not to do any more of faces on my blog until I’ve had my brows sorted (Tuesday!!) so you’ll just have to wait. But trust me, amazing is the word for all of it. When you use these products, you can just tell they are expensive. Everything about them screams “quality”. Am so pleased with my haul but wish perhaps that I’d swapped one of the pinky shadows out for the blue or green that was also in the sale, so I hadn’t ended up with such similar shades. Anyway, here’s some blurry swatches. The light brown smudge down the left side is the bronzer, above that is the blush end from the decadent duo, above that is the gloss from the decadent duo. Down the right hand side are the three eyeshadow swatches, the top one being Gracious Arasari, followed by Tantalizing Lovebird and the bottom one is Veiled Lyrebird. The smudge down the middle of the the two columns is the remains of earlier swatches I didn’t think to clean off properly…oops! So what do you think? Do you own any Rouge Bunny Rouge that you recommend? Are you tempted or is the price just too much for you? Rouge Bunny Rouge is available from the fabulous http://www.zuneta.com/. Which by the way, if you haven’t visited yet, you should. My Fyrinnae Order, Swatches & EotD. Pic Heavy! After what seems like an eternity my Fyrinnae order arrived today. It didn’t take an eternity at all. It’s just a case of a watched kettle type situation. Anyway, it arrived, very well packaged and I particularly liked the skull and crossbones tissue paper! I realise now looking at my samples that if I didn’t already, I now own enough eye colours to last me all of my lifetime and probably both of my daughters lifetimes. Averaging $2 per sample, there’s enough there to keep me going for a long long time. I grabbed a big selection of shades, although I notice looking through them, most are neutral ish shades, browns, greys and so forth. Nearly all of them are very sparkly and I bought several of the arcane magic shadows which are duochromes. So pretty. So if you’re ready I’m going to take you through looking at close ups and swatches of all the shades I got. All are swatched on bare skin unless otherwise stated. The little black pot is a sample of Pixie Epoxy. Atomic Afterglow and Rapunzeld Had Extensions really stands out. I was completely unable to capture the pink in Catrina Caberet but trust me it’s there and very pretty. You can’t tell from this pic but Immortality is AMAZING, see later for a better look at it, I’m also completely loving Half-Elf Hottie, again you can’t really tell but it’s cream with pink duo. Very nice. Te Amo is also a stand out. Both of these are stunning but Fire Opal has this lit from within effect that is really stunning. I wouldn’t have chosen either of these, particularly the green, but I’m game! Do you see the rainbow coloured sparkle in Immortality? No? What about now? I’ve had a little chance to play and as always, forgive the eyebrows, but I’m staggered how easy it is to create an eye look I’ve always wanted to be able to do. This is Atomic Afterglow and Rapunzel had extensions over Pixie Epoxy. I love it! What do you think? Are you tempted by any? If you know a lot about this brand do you have any recommendations for me? You are all probably a bit sick of hearing about the Mac Venemous Villains collection by now, so I’m sorry for yet another post. I wanted a few bits, but not heaps from this collection but when it came down to it lack of funds dictated my purchases so I ended up with just two items from the collection. I also bought my first paint pot as I wanted to try using it as an eyeshadow base. So, I purchased A Bite of an Apple blush, Bad Fairy Nail polish and Soft Ochre paint pot. My first thoughts are that I’m really disappointed with the blush. It’s a nice colour but it’s not as pigmented as I’d hoped for and I was hoping for far less pink and considerably more red/orange. I also picked up Bad Fairy polish. All three of the polishes from the collection look gorgeous but I’m told the other two polishes are exact dupes of two of the Orly Cosmic FX polishes but Bad Fairy isn’t a dupe so I had to get it. Lastly I grabbed Soft Ochre paint pot, having quickly swatched it, it is almost invisible on my skin, this is fine as I bought it to use as a base for eyeshadows. I’m going to have to be careful not to mix it up with my Studio Sculpt concealer which is in and identical pot and a very similar colour! I decided yesterday that actually I wanted one of the Mineral Eyeshadows and Toxic Tale lipstick, but I was too late, they’ve sold out. It’s my own fault but I’m disappointed. If anyone has either of those items and wants to sell or swap please let me know! 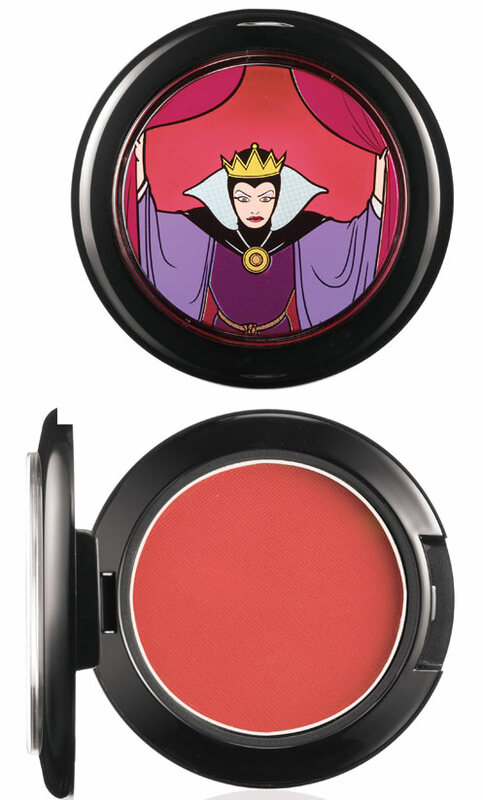 I also feel compelled to show you the official Mac imagery for Bite of an Apple Blush. You tell me, does it bear any resemblance at all to what I actually got? No I don’t think it does. I feel tempted to complain actually. So did you buy anything from the Venemous Villains collection? Does it live up to your expectations? Did you get there too late and it had sold out? I will bring swatches and nails of the day soon. I expect by now you’ve all seen this new Mac Collection. It’s huge. I wanted lots of bits from it but common sense took hold and I scaled my list down considerably to just four items. I also changed my mind right at the last minute about which quad I was going to get… it was going to be the purple (Burmese Beauty if I recall correctly) but at the last minute I decided upon the Leopard Lux one and I’m so glad I did! So theres the Desires & Devices Liquid Liner, The Leopard Lux quad (yes you do spy a taupe there), the Wildly Refined Lipglass and Aristo-Cat Lipstick. And here’s two swatch photos because I couldn’t decide which was the best…. I would especially recommend enlarging the last picture. I think its obvious which swatch is which but the top row is the liner and quad, underneath is the lipglass and under that the lipstick. The Leopard Lux quad is really lovely. It’s a bit different from the usual neutrals, I love the yellowy shades, the camel and the gold, which make a change from creams and beige. So have you bought anything from this collection or is it just too meh for you? So amongst my Twitter friends, this collection and Mac in general seem to generally be out of favour. Undaunted though, I acquired a large part of the collection. I’m really quite thrilled! What really appealed to me about the shadows was the colour combinations. I love them and I’d never have thought of them on my own, I’m just not creative like that, Soften The Mood (the pink, blue and frosty plum) is especially beautiful. I also think the shadows are good value for money. I also wanted to talk about the MSF’s. I already have By Candlelight and it’s beautiful and I wanted to get Stereorose, and that is really stunning but for me, the absolute stand out is Petticoat, I expected to like it but I had no idea it would be SO beautiful. I’ve not done swatches because there are already so many around, but I am happy to if anyone wants any, and of course I’ll be doing some FotD’s with them. Just let me know if you want swatches. In case you live in a bubble and have sadly missed my many updates, it is my birthday tomorrow. As a special treat my sister came down for the day and took me out for lunch and for shopping. It’s the first time I’ve ever left Lola for any length of time, and I didn’t know myself. Really! Anyway, we had a lovely lunch sat outdoors on the Cathedral Green at Michael Caine’s Brasserie and it was lovely and then we went off in search for a pressie. I showed her (amongst many other things) a Chanel quad I was in love with, which sadly was out of stock (Garden Party if you’re interested), I really need it, it’s stunning. Instead we left with my second choice of the Murano quad. It’s very lovely, a dark grey/black, a teal, a light light grey/turquoise and a pink. It’s very lovely. If anyone finds Garden Party though I’d love it, none of my local stores had it and I can’t find it online either. Anyway, aside from that, I got another Guerlain Kohl in the post this morning. The discontinued Secret Glow. It’s a beautiful pearly cream gold and really shows up beautifully on my waterline. All in all a very satisfactory day! The kohl swatch is on the very left. Happy Days. Hope you are all having a nice time in this fab weather! As you will have seen in my previous posts there are a few new Lush producs knocking around so I had a sneaky little order. Reviews will follow in due course! That’s 2 Space Girl Ballistics, they aren’t new products, I just love them, Keep It Fluffy Ballistic, Charlotte Island Body Tint, Grass Shower Gel, Happy 4 Sad Shower Gel, Glorious Mud and samples of Lovely Jubblies and R&B Hair Treatment.